I have to share because my heart is beaming. 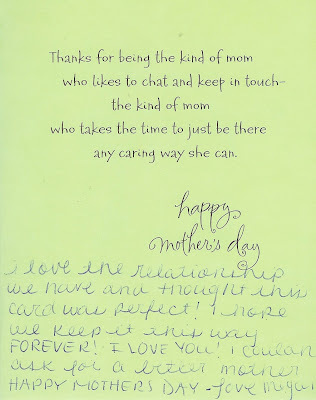 Here is the card my 15 year old daughter Megan gave me yesterday. It made me cry. I always vowed that I would have a better relationship with my children than I had with my parents. I try not to judge them and let them be who they are. I give my opinion, but I let them make their own decisions because they are the ones who have to deal with the consequences. Believe me there have been more than a few times that I said "I told you so". LOL. I have made more than my share of mistakes in parenting. I am not perfect but my children still love me! I feel very blessed that both of my children are growing up to be wonderful individuals. They have good hearts and I love them dearly. can't wait to see it in the magazine!